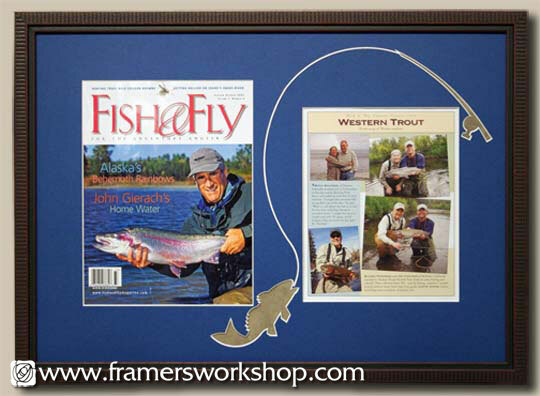 One of our clients gave us this Fly Fishing magazine cover and article for framing. Like many of our regular clients, she asked us to choose the design for her. Knowing that she enjoys frames with some flair, we designed the acid-free matting with our Wizard computerized mat cutter using a fish and fishing rod joined by a fishing line as decoration. We used UV glass to protect the images and a colorful blue and brown rustic frame. Our client was surprised and delighted!